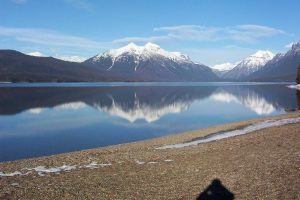 There’s no shortage of amazing lakes in Glacier Park, from long finger lakes carved out as the glaciers receded millions of years ago, to shallow moose-country ponds. The lakes greatly range in size and elevation, some are very large and some are quite small, but all the lakes in Glacier National Park have crystal clear aquamarine waters which provides depth visibility of 30 ft (9.2 m) or more. Lake McDonald is the largest Glacier National Park lake. It is a finger lake approximately 10 miles (16 km) long, over a mile (1.6 km) wide, and 472 ft (130 m) deep. Lake McDonald was formed by Ice Age glaciers carving the basin millions of years ago. The surface area of this lake is 6,823 acres and sits at an elevation of 3,153 ft (81 m). McDonald Creek feeds into the northeast end of Lake McDonald. There is some dispute how this lake got its name, some say it was named after Duncan McDonald. Duncan was the son of Angus McDonald, a well known agent of the Hudson Bay Company. In 1878, he camped at the foot of this lake while traveling to Canada. He supposedly carved his name and date into a nearby tree. Yet others claim it was named after John McDonald, a trapper who had a cabin on the lake and was well known in the upper Flathead Valley in the 1880s. He was lynched by a mob for horse stealing in 1885 but the charge was suspected to be a frame-up to get John’s money. Lake McDonald is located just inside the West Glacier Entrance along the Going-To-The-Sun Road. The Lewis and Clark Range forms an exquisite backdrop for this lake, which many times will have a beautiful reflection in the Lake. The village of Apgar is located at the McDonald Creek outlet. Small motor boats, canoes, paddle boards, and kayaks are available for rent in Apgar. The often calm waters and warm temperatures makes Lake McDonald very conducive for these activities. The waters of this glacial lake are not very warm but there is a beach area at the southwest end of of the lake for anyone who wants to do some swimming. Boat tours are also available on Lake McDonald. Saint Mary Lake is the second largest of the Glacier National Park Lakes. A glacial finger lake at 9.9 miles (15.9 km) long, is nearly the same length at Lake McDonald but not as wide or deep. It’s depth is 300 feet (91 m) with a surface area of 3,923 acres. Saint Mary Lake lies almost 1500 feet higher than Lake McDonald at an elevation of 4,484 feet (1,367 m). The waters of this Lake are also cooler and rarely rise above 50°F (10°C). Because of the cold winters on the east side of Glacier Park, the lake is often completely frozen over with ice up to 4 feet (1.2 m) thick. Saint Mary Lake is fed by Saint Mary River at the western end of the lake. The naming of Saint Mary Lake is a mystery. Some say it was named by one of several Jesuit priests who traveled this countryside during the late 1800’s. And some think it’s could have been named by Hugh Monroe or Henry Kennerly. Others think it could have been named by the Kootenai chiefs who brought their band to camp at Saint Mary Lake for prayer. This beautiful Glacier Park lake is located along the Going-To-The-Sun Road just inside the Saint Mary entrance to Glacier Park. Saint Mary Lake is surrounded by mountain peaks with Red Eagle Mountain being one of the more prominent ones. It is home to various trout species. Because of it’s cool waters, it is not very conducive for swimming – at least for not very long. The most notable feature of Saint Mary Lake is Wild Goose Island. The town of Saint Mary is located at the northeastern end of the lake. About half way up the Lake, you can catch one of the boat tours on Saint Mary Lake. Avalanche Lake sits in a bowl shaped canyon surrounded by Bearhat Mountain, Little Matterhorn, and Mount Brown. Avalanche Lake was named by Dr. Lyman Sperry for all the avalanches he heard roaring down the mountains surrounding the lake as he scaled the basin trying to reach the glacier above it. At an elevation of 3,905 ft (1,190 m), the trail to Avalanche Lake is one of the first to open in Glacier National Park. It’s an easy 2.5 mile (4.2 km) hike into Avalanche Lake and is one of the most visited backcountry Glacier Park lakes. The Avalanche Lake Trail is the only access to the lake. Across the lake, cascading hundreds of feet down Bearhat Mountain and Little Matterhorn, are several long waterfalls which feed Avalanche Lake. There is a small beach at the foot of Avalanche Lake where you can test your stamina in it’s cool waters. Or you can rest on one of the benches on the beach and relish in the beauty of Avalanche Lake and it surrounding mountains. Access to Avalanche Lake Trailhead is 5.5 miles (9.2 km) east of Lake McDonald along the Going-To-The-Sun Road. The trail starts out as Trail of the Cedars, a barrier free trail. Kintla Lake is the forth largest glacial finger lake of the Glacier National Park lakes. It is 8 miles (13.3 km) long, up to a mile wide in places, and a total of 1,698 acres. It is located in the wild, remote northwest portion of Glacier National Park accessed by 30 miles of bumpy dirt roads from Smoky Bear Ranch. Surrounded by Starvation Ridge and Parke Ridge with stunning views of peaks in the Livingston Range, it lays at an elevation of 4008 ft (1,221 m). 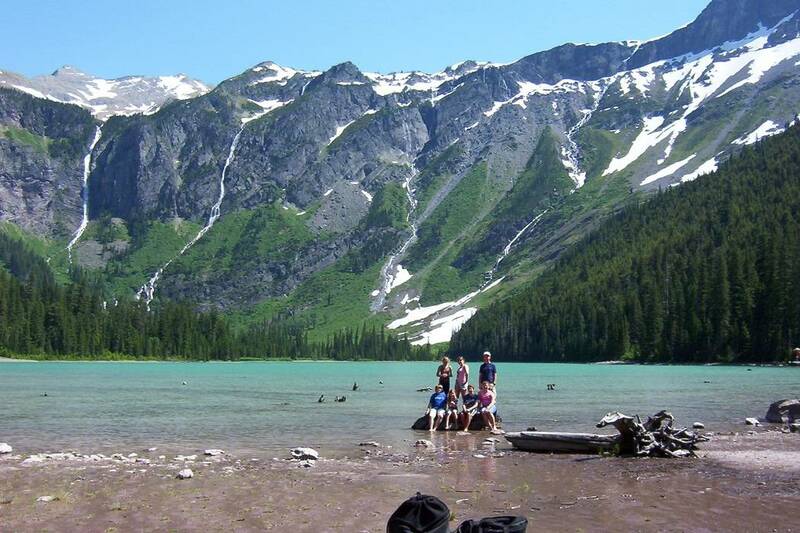 Kintla Lake gets its name from a Kootenai word meaning “sack”. The Kootenai Indians usually avoided the waters of Kintla Lake as legend has it because one of them drowned and the body was never recovered. No motorized craft are allowed on Kintla Lake which makes it a paddlers paradise. Because of the generally calm winds, this is one of the best canoeing lakes of the Glacier Park lakes. If you don’t own a paddle watercraft, you can rent one from North Fork Recreation. The cool waters of Kintla Creek feed Kintla Lake, there is a beach at the foot of the lake if you’re daring enough to test out the waters. Fisherman will also enjoy Kintla Lake, it is home to our native Westslope Cutthroat Trout. Iceberg Lake is a small glacial lake sitting in the shadows of Mount Wilber and Iceberg Peak. At an elevation of 6,094 ft (1,857 m), this amazing Glacier Park lake will have a thick layer of ice on it each winter. Because Mount Wilber and Iceberg Peak rise about 3,000 ft (923 m) above the lake, it receives very limited sun resulting in year around floating icebergs. It is a rare occasion when Iceberg Lake is left with no icebergs. Needless to say, Iceberg Lake is named for the floating icebergs. Either Hugh Monroe or George Bird Grinnell named this lake in the 1800s. Iceberg Lake is an aquamarine jewel with huge chunks of ice floating around in it, some large enough to stand on. The waters are just above freezing so a quick dip of your toes in the lake or a splash of it’s icy waters on your face is about all you’ll be interested in. 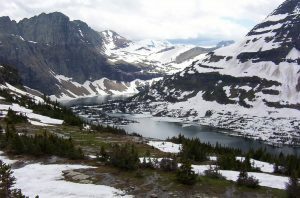 Access to Iceberg Lake is by a 4.7 mile (7.8 km) trail which begins behind the cabins at Swiftcurrent Motor Inn in the Many Glacier area of Glacier Park. The trail starts off rather steep but then levels off becoming a fairly easy hike. Because of this lakes high elevation, this trail typically doesn’t open until mid-July. Hidden Lake sits in a bowl surrounded by Clements Mountain, Reynolds Mountain, and Bearhat Mountain. It is a smaller glacial lake sitting at an elevation of 6,375 ft (1,943 m). Being fed by snowmelt from these three mountains, it is a cold water lake and not very conducive for swimming. The cold waters of Hidden Lake make it a great home to a large population of Yellowstone Cutthroat trout. Hidden Lake was originally called Bearhat Lake after the prominent Kootenai leader. In the 1934, Bearhat was switched to name the mountain and it became known as Hidden Lake. Access to Hidden Lake is a relatively short and easy hike taking off from behind Logan Pass Visitor Center. 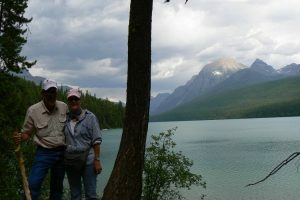 It is one of Glacier Park’s most popular gems. At the 1.5 mile (2.4 km) point, you will reach the overlook where you’ll embark on fabulous panoramic views of Hidden Lake and the surrounding mountains. The most prominent mountain will be Bearhat Mountain. Most visitors don’t continue on down to the lake from here. The foot of Hidden Lake receives a lot of fishing pressure. 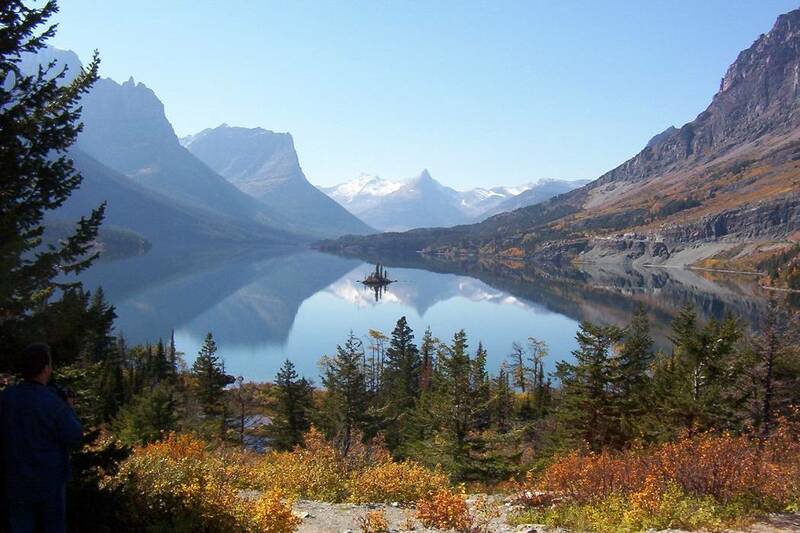 These are just six of the amazing Glacier Park lakes, there are many more in Glacier National Park.